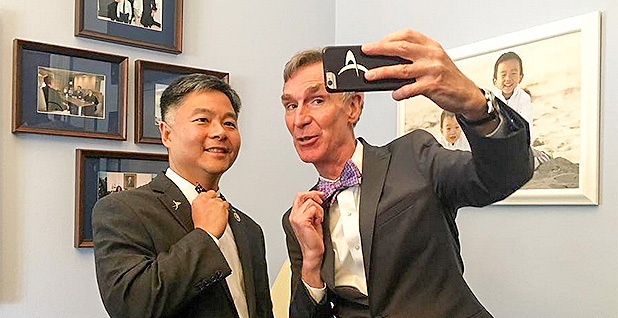 Rep. Ted Lieu (D-Calif.) takes a selfie with Bill Nye (pictured right) in the U.S. Capitol. Photo courtesy of reptedlieu via Instagram. Rep. Ted Lieu wishes he could veto President-elect Donald Trump's pick to lead U.S. EPA. The California Democrat is troubled by the incoming administration's environmental agenda and Cabinet picks, but he thinks he and his colleagues have an important role to play in acting as a check on the Trump White House. Lieu joined the House in January 2015, filling the seat that had been occupied for decades by retired Democratic stalwart Henry Waxman. Lieu has become one of the chamber's vocal proponents of federal action to combat climate change. This week, he was appointed assistant whip for the House Democrats. He recently chatted with E&E News about what it's like to reach sophomore status, his favorite character on HBO's "Game of Thrones" series and his inconvenient fear of flying. You just assumed non-freshman status in the House. How does that feel? I'm a sophomore now. I'm thinking of all the different ways to teach the freshmen the incoming things they need to do, like come up with a freshman fight song, do a freshman talent show in the middle of the years. We'll see how that goes. No, but I want them to think that. What's the mood of House Democrats preparing for the Trump administration? I think it's a combination of anger, anxiousness and hope. I know it's sort of weird to have those three simultaneous feelings. ... I think there's hope that the American people will be — as they always have been — a check on government overreach, and Democrats are in a tremendous position to highlight and point out any abuse of power or overreach by the incoming administration. Have you heard anything that makes you optimistic about climate and energy policies for the next four years? No. The nominations by the incoming president are very troubling. If you could veto one of Trump's Cabinet nominees, who would it be? It would be Scott Pruitt. I think he is exactly the wrong person for the Environmental Protection Agency. You were born in Taiwan. How old were you when your family moved to Ohio? Why did your parents decide to move the United States? To seek the American dream. We started off living in the basement of a person's home. We were poor. My parents did not speak English well. To make ends meet, they went to flea markets and swap meets and sold gifts and jewelry. Over many years, they saved up their money, eventually opened one gift store in a shopping mall. ... Eventually, they expanded to over six stores, and in my mind, they achieved the American dream. It was moving boxes, operating a cash register and trying to sell gifts and jewelry to customers. At a very young age, I could tell you different qualities of jade. Are you a Cleveland sports fan? I'm a long-suffering Cleveland Browns fan. I try not to be. I'm very pleased that the Cleveland Browns were relentless in their strategy this year of losing virtually every game in order to get one draft pick next year. I recently finished "The Martian" not too long ago. I tend to like science fiction. ... It gives you the possibility of what it could be like in the future, and I find that very exciting. Are there any TV shows you're addicted to? "Game of Thrones." I think I'm the only one in Congress that has this: On my desk in my Capitol office is this miniature Iron Throne the producers sent me, and I'm very excited about it. ... I met the producers of "Game of Thrones" at the Directors Guild award ceremony a few years ago. I tell people it's an interesting show because no good deed goes unpunished. I do like Jon Snow; I think it's very sappy to like him, but I do like Jon Snow. In the last episode, I think a killer ending would be on the Iron Throne if a White Walker sits there. Do you have inside information about that? What would surprise people the most about you? I don't like flying. It is an ironic job for me to have for a person who doesn't like flying. And it's ironic that I'm also in the Air Force. A rational part of my brain understands why this big piece of metal is floating up in the air at 30,000 feet. The emotional part of my brain doesn't get it.